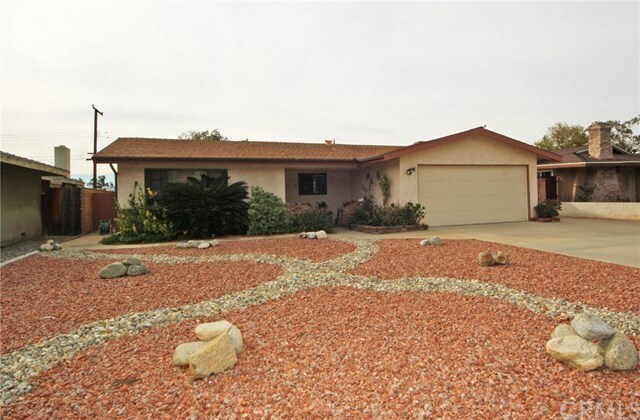 Looking for a spacious single-story home with a pool in Rancho Cucamonga? Take a closer look at this one! Located on a cul-de-sac in Etiwanda, this pool home offers a large living room, eat-in kitchen with plenty of storage space, a stone-finished fireplace in the family room, plus a large game room with a bar, beamed ceiling and sliding glass door to the pool! The master bedroom has mirrored closet doors and a private bathroom. The two-car garage offers a laundry area and plenty of storage built-ins, plus extra storage space in the rafters. Enjoy the pool, covered patio, additional free-standing patio, wide side yard, mountain view and block walls. This yard is south-facing for maximum sunlight all day. Potential for RV parking too! We are located in the award-winning Etiwanda School District near Victoria Gardens, restaurants, shopping, parks, fitness trail, hiking trails and more!